It’s not hard to understand that people get bored with the usual farming, and growing your plant act. I myself find that useless and boring too! Fortunately, Senga, that is famous for creating Farmville and other games has released the iPhone Kingdom Conquest app, proving that there’s more you can do in your farm than just cattle herding and plant propagation. Those who love We Rule and Farmville don’t necessarily leave their farm city and animals with Kindom Conquest. What they can do is to add action, thrill, and violence to it. If this starts to sound interesting that’s great since there a lot of information that I will share about this app. Kingdom Conquest App for iPhone really works great particularly for those who love real-time games, and have the hype to interact with other players online. You can’t only ask your friends to be your neighbours, but you can also compete with them. The twist of this game is that it’s not only limited to farming plants and animals. I will call this a weird, but funny twist since you have to build your own army of monsters to help you destroy other players’ farm. Of course you won’t expect them to just let your army of monsters defeat them. This is where the fun part comes in. Though the game may feel repetitive at times, there’s a little room for boredom. There are actually stages that you can interchange for that unlimited fun and adventure. First is farming which allows you to build your farm using your resources. You will have wood, iron, food, and stone. This stage already requires strategy since great concept will earn you points you can use in the future. Second is collecting and propagating monsters. Make sure to build the strongest army so conquering the neighbouring lands will be a piece of cake for you. The third is the most interesting level. You will crawl in dungeons full of enemy, but the great thing is you can bring your friends with you. 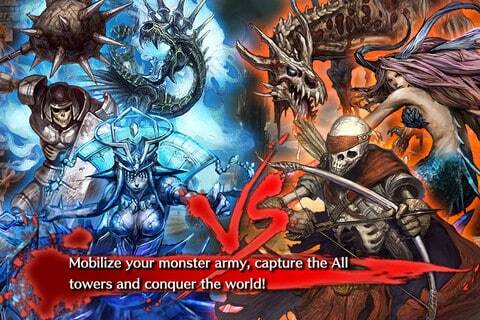 You will earn points by defeating the leader of the dungeon so make sure you achieve that in every action. There are actually a lot of things you can do on this game. iPhone Kingdom Conquest app can be your best companion when you and your iPhone are alone, and don’t have the idea on what to do. You can try the app now so you’ll know what I am talking about. 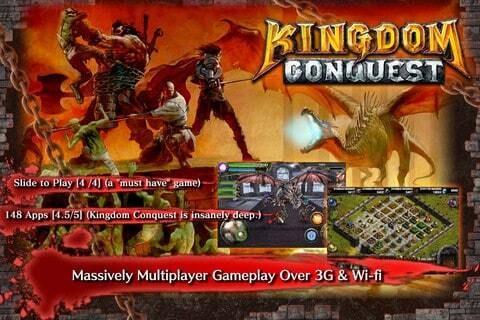 You could download Kingdom Conquest iPhone App here. Ranked Number 1 in the Free RPG games chart in various countries. Experience the unique mix of 3D multiplayer dungeon crawling action and Massively Multiplayer Real-Time Strategy! Reclaim the throne of El Dor by forming alliances with other players to gain control of the 7 towers in Magna, the Land of Monsters. This epic quest will challenge your loyalties and bravery in a world filled with dangerous monsters and cunning opponents. There can only be one alliance to rule the rest. Will it be yours? > There are no serious problems that prevent gameplay. > There is a minor issue with the display of the Japanese Romaji keypad. We will patch these issues in a future version update.